Track co-chair for the 13th ACS/IEEE International Conference on Computer Systems and Applications (AICSSA), 2016. The 8th International Conference on Mobile Web Information Systems (MobiWIS), 2011. IEEE Transactions on Knowledge and Data Engineering (TKDE). ACM Transactions on Spatial Algorithms and Systems (ACM TSAS). Distributed and Parallel Databases, An International Journal (DAPD). International Journal of Data Engineering (IJDE). ISPRS International Journal of Geo-Information (IJGI). Mindanao Journal of Science and Technology (MJST). Undergraduate Academic Advisor for students # (1056:1173, 1347:1361, 1623:1715, 2275:2384), Alexandria University, Egypt. Judge for the Undergraduate Research and Poster Symposium, Purdue University, 2008. Conference external reviewer for: SIGMOD'06, VLDB('06, '05), ICDE('07, '06), CIKM'06, EDBT('09, '06), MobiDE'06, RankDB'07, GIS('08, '07, '06, '05), DASFAA'05, TIME'05, ISORC'05, Mobicom'04, Globecom'04, ISCC'04. Organizing committee: Midwest Database Research Symposium 2005. Advisor of the Rover Scouts, Faculty of Engineering, Alexandria University, 2013/2014. Applied Management Principles Program, Krannert school of management, Purdue University, 2009. President of the Egyptian Student Association in North America (ESANA), 2008-2009. Outstanding Service Award, Department of Computer Science, Purdue University, 2007-2008. Citizens Police Academy, Purdue University Police Department (PUPD), Spring 2008. Here is the Certificate of Completion. President of the Egyptian Student Association @ Purdue, 2007-2008. Purdue Graduate Student Senate, 2007-2008. Here is the Certificate of Recognition. 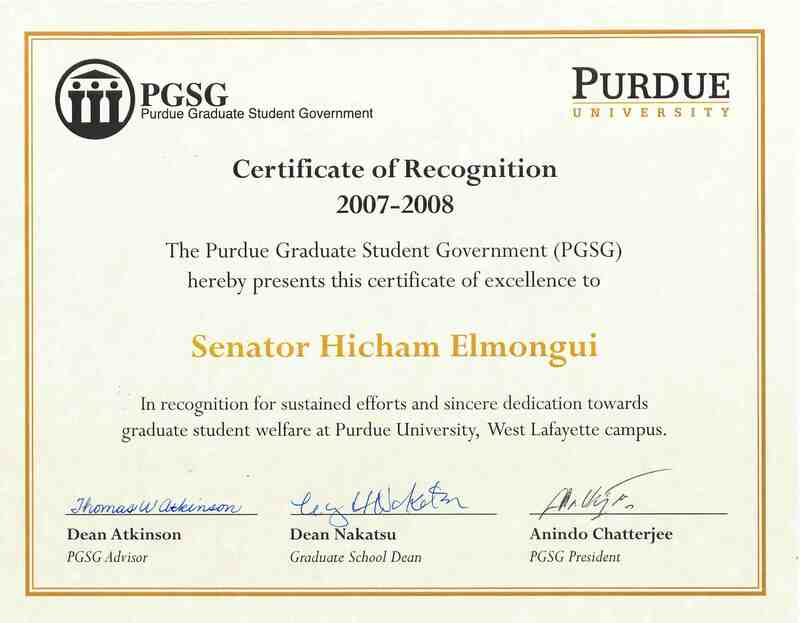 Purdue Graduate Student Government Representative, 2007-2008. Purdue College of Science Graduate Student Council, 2007-2008. Computer Science Graduate Student Board @ Purdue, 2007-2008. Founding member of the Purdue Graduate Student Cancer Coalition, 2007. Research Intern in the Data Management, Exploration and Mining Group (DMX) at Microsoft Research, Microsoft Corp., Redmond(WA), May-August 2008. Research Intern in the Database group at Microsoft Research, Microsoft Corp., Redmond(WA), May-August 2007. Research Intern in the Database group at Microsoft Research, Microsoft Corp., Redmond(WA), May-August 2006. Member of Microsoft Research Alumni Network. Member of the honor society Upsilon Pi Epsilon.